(PRLEAP.COM) CORNELIUS, OR, May 10, 2012: Sheldon Manufacturing, Inc. introduces the SHEL LAB Bactrox Chamber, the latest addition to its industry leading Bactron line of anaerobic chambers. The Bactrox offers precise oxygen and carbon dioxide control from 1-20%. 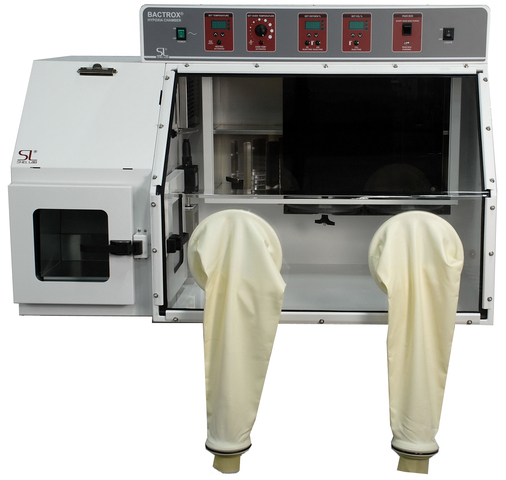 The SHEL LAB Bactrox Chamber (http://www.shellab.com/store/lab-products/Bactrox) preserves optimal application conditions not only during incubation but also in the chamber work station. Removal of cultures from the incubator does not require exposure of cells to undesirable oxygen or carbon dioxide levels. The unit's advanced atmospheric controller allows for the use of a highly accurate and long-lasting zirconium dioxide oxygen sensor, with independent oxygen and carbon dioxide control and logging. The Bactrox also has a standalone 300 plate incubator so users can comfortably work without gloves in ambient room conditions. "It is exciting to bring this type of technology to our Bactron line. Most importantly, it broadens the scope of research that can be performed by our customers," states Dan Sheldon, President of Sheldon Manufacturing, Inc. "Our Bactrox chamber expands the efficiency of our Bactron line to even more scientific applications." To minimize set-up time, the Bactrox includes an extra- large vacuum-less sample pass box that takes only sixty seconds to purge. The new design provides a vacuum-less sleeve entry into the chamber. Other features of this unit include temperature control and logging, superior condensation control, and ultra bright LED examination lights inside the chamber. The Bactrox is ideal for stem cell research, mammalian cancer research and clinical and research microbiology, and joins the SHEL LAB line of Bactron Anaerobic Chambers (http://www.shellab.com/store/categories/1-bactron-chambers/) including the BacBASIC, and Bactron I, II, III and IV. The Bactrox is available through SHEL LAB distribution partners. Over the past 40 years, Sheldon has worked with industry leaders to design solutions for production and research needs across the entire constant temperature/environment spectrum. Over that time, our reputation has grown as an innovator of reliable equipment designed for demanding environments. Sheldon Manufacturing, Inc. was founded in 1970 with the goal of being a worldwide leading manufacturer of constant temperature equipment and has been designing and manufacturing equipment for the biotechnology, pharmaceutical, research and production markets ever since.